After the last seminar we did, my team and I have been working seriously to put the package online. The reason is that, these ideas are too powerful and I can’t imagine anybody missing it. We have dedicated enough time for it and now it is live online. I am so sure that the knowledge you will get from the training will be the game changer you have been waiting for if and only if you do what I taught in this training. You see, as per the extensive insight that I shared, I am not just at teacher of it, I am fully implementing every thing I taught in the training. It is about 4 hours comprehensive, no-nonsense training that will guide you and turn you to traffic magnetic. You don’t even need to practice all the traffic ideas at once, just start taking it one after the other and you will be surprised that your ghost town website will soon turn to mega city website and what follows will be massive sales. I thought I will be having the seminar again this weekend, Saturday, 28th October, 2017 but I am sorry, I will not be having it again. The online version, I believe will serve a lot of our people that are all over the nation, Abuja, Ibadan, Portharcourt, Uyo, Ilorin including those that are outside the country. Just take a leap and be part of it today. On that site, just go ahead and register. I am not having any live seminar yet but then, if you pay today, you will have access to the online version and I will also grant you access to be part of my next physical seminar on the same topic and that will be a double opportunity for you ONLY if you REGISTER on the site and make PAYMENT TODAY. I will sincerely close that live seminar privilege after TODAY, please take note of that. We may likely price the next seminar higher than what we have now but jumping in right away will save you that extra cost. For those that attended the previous training, I will send you access link to the online version later today and I will want you to take massive action immediately. It is not enough to attend seminar, you only get result whne you take action. This is to inform you that we have done some changes to our product access portal. What it means is that, if you have bought any product from us before or you are just buying new one, you will now have access to all the products with just a single login detail. From there, you can access all the products you have bought from us. For example, if you have bought about five products from us, when you login to the Product Access Portal, you will see all your products there and you can click anyone to have access to the product. Your subsequent products will also be added to the place. With this, you don’t need to be raking your brain to remember where you have a particular product you bought from us or searching frantically through your email to recover a download link. Therefore, if you are a MEMMA member and you suddenly found yourself on a page that is not looking similar to what you are used to, just click on the MEMMA Starter product link or MEMMA Pro product link on the page and you will be at the right product page. We hope this will be very useful to all. Gbeminiyi Oluwabusola is a web developer, internet/information marketer, team leader and an entrepreneur. He is the MD/CEO of MeritChoice Limited. 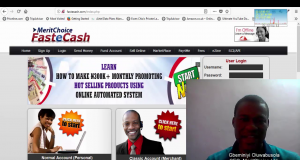 He is currently running an internet marketing programme on How Anyone Can Be Making ₦300k+ Monthly Online. Click here to learn more. Are You Interested In Online Business Or Online Job?